Lovingly restored, ‘lost’ album captures late great Toronto-born guitarist at his peak. Blind from early childhood, Healey’s furious lap-style guitar technique and emotional intensity made him one of the most mesmerising performers of his day. 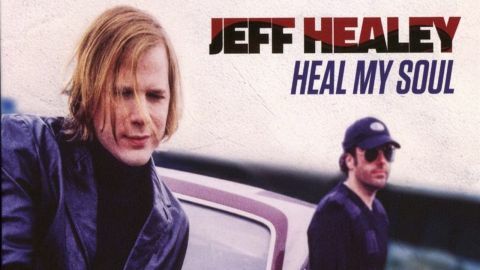 More than eight years after his death (from cancer, in 2008) Heal My Soul hits like a beyond-the-grave whirlwind. Recorded between 1996-1998 the songs mark the apex of both the friction and creativity born from his relationship with his power trio associates, bassist Joe Rockman and drummer Tom Stephen. In contrast to that band’s lacklustre 2000 parting shot Get Me Some, these wracked and scathing performances - from the title track, to Moodswing to the country soul-soaked, sad-eyed closer It’s The Last Time – are unmistakably personalised Healey career highlights. Producer Roger Costa and Jeff’s widow Cristie deserve credit for keeping this music in its pure unvarnished splendour. Healey’s never sounded more alive – his legacy and fans both old and new are the sure and certain beneficiaries.